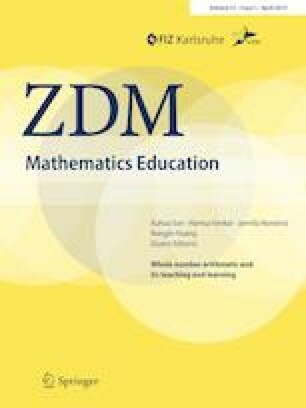 In this article we outline the role evidence and argument plays in the construction of a framing theory for Proof Based Teaching of basic operations on natural numbers and integers, which uses tiles to physically represent numbers. We adopt Mariotti’s characterization of a mathematical theorem as a triple of statement, proof and theory, and elaborate a theory in which the statement “The product of two negative integers is a positive integer” can be proved. This theory is described in terms of a ‘toolbox’ of accepted statements, and acceptable forms of argumentation and expression. We discuss what counts as mathematical evidence in this theory and how that evidence is used in mathematical arguments that support the theory. Supported by research funds from the Bundesministerium für Bildung und Forschung (German Federal Ministry of Education and Research), Grant number 16SV7550K, through the grant program “Erfahrbares Lernen” (Experienceable learning). See https://www.technik-zum-menschen-bringen.de/projekte/mal. Cid, E. (2015). Obstáculos epistemológicos en la enseñanza de los números negativos. (Doctoral dissertation). Universidad de Zaragoza, España. http://www.atd-tad.org/documentos/obstaculos-epistemologicos-en-la-ensenanza-de-los-numeros-negativos-tesis-doctoral/. Accessed 6 Jan 2019.